The Singapore Government’s Industry Transformation Map (ITM) for the construction industry was launched yesterday. Minister for Social and Family Development and Second Minister for National Development, Mr. Desmond Lee, officiated the launch alongside representatives from various stakeholder groups involved. Roadmaps are being developed for 23 industries to address issues within each industry and deepen partnerships between the Government, firms, industries, trade associations and chambers. The ITMs are grouped into 6 broad cluster: Manufacturing, Built environment, Trade & connectivity, Essential Domestic Services, Modern services and Lifestyle. The construction sector is a significant contributor to Singapore’s economy. 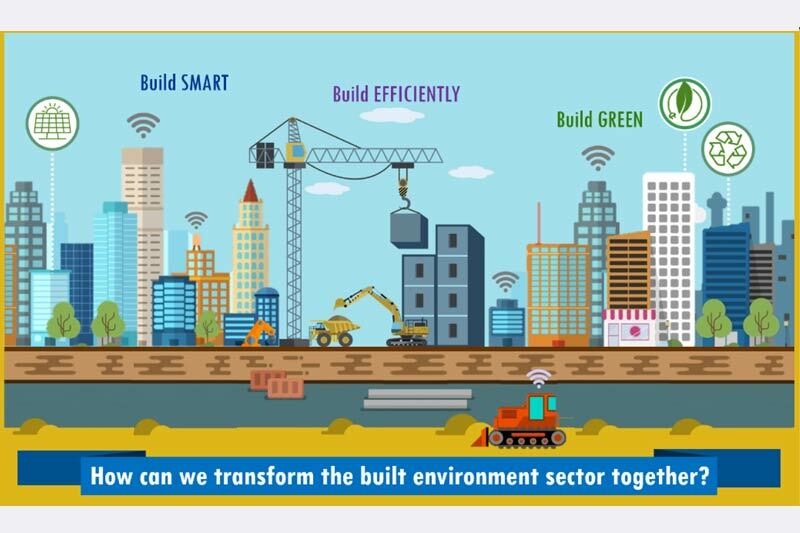 The built environment sector alone contributes to about 6% of the Gross Domestic Product (GDP). The Construction ITM is one of the five sectors under the built environment cluster, which includes the real estate, security, environmental services and landscape sectors. It envisions an advanced and integrated sector with widespread adoption of leading technologies, led by progressive and collaborative firms well-poised to capture business opportunities, and supported by a skilled and competent workforce offering good jobs for Singaporeans. The ITM recognises key global trends which impact the sector such as the digital revolution, rapid urbanisation and climate change and identifies Integrated Digital Delivery (IDD), Design for Manufacturing and Assembly (DfMA), as well as green building as key transformation areas to address the challenges faced by the sector. The development of the Construction ITM involved extensive consultation and engagement with the stakeholders over a year. The continued collaborative and concerted effort by all parties, including industry firms, unions, institutes of higher learning and the government, is crucial for the successful implementation of the ITM to realise the collective vision of the sector. The Construction ITM is a live document and feedback from the industry will continue to be progressively incorporated into it, so that it can evolve to keep abreast of how key trends and shifts shape up globally and in Singapore. Construction involves many parties at different stages of a project, and good coordination is critical in preventing unnecessary reworks along the way. IDD aims to strengthen coordination and foster collaboration by connecting all parties through digital information and technology. IDD builds on top of BIM, or Building Information Modelling. It leverages cloud and digital technology to integrate stakeholders in the building life cycle management. It connects the entire project delivery process from design, fabrication, to assembly on-site, as well as operations and maintenance of buildings when construction has completed. Several firms in different parts of the industry have started using tools like RFID tagging and data analytics to track and automate their project processes. Plans are underway to encourage adoption of shared platforms and standards to fully integrate the parties involved in building projects. The Government has schemes to help firms level up on BIM and work through all the teething issues that they face. To drive the adoption of IDD, a masterplan is being developed by bringing the various parties and stakeholders together. As a start, shared platforms and standards will be developed to ensure IDD interoperability across the entire construction value chain. In terms of more effective and productive construction methods, the ITM focuses on Design for Manufacturing and Assembly (DfMA). DfMA involves transforming construction and making it more like a manufacturing and design process. Aspects of construction would be shifted from an open worksite into a controlled environment, such as a manufacturing plant, to prefabricate quality building components before bringing them onsite and assembling them. It means projects that can be completed faster, cleaner, quieter, and with better quality. The national target is to achieve 40% DfMA adoption by 2020. From fewer than 10 projects just 4 years ago, there are almost 40 projects in different stages of development using various types of technologies at the higher end of the DfMA continuum. To support this, the Government has three highly automated Integrated Construction and Prefabrication Hubs (ICPHs). Two more of these facilities are under construction, and there are plans for another five more of these. The transformation of the sector will result in redesigned jobs involving higher skills, more competitive salaries and better work environment to meet the aspirations of Singaporeans. With the push for DfMA and IDD, construction will become more like manufacturing. This can create new niche areas and jobs for Singaporeans, where none used to exist. For example, there will be more jobs to operate high tech machinery and to use computer software that promotes integrated design. For example, new roles such as production engineers and supervisors overseeing manufacturing of prefabricated concrete walls, and BIM managers have been introduced to the sector, and they work in a more conducive indoor work environment as compared to conventional construction work. The traditional worksite will also be transformed to become more streamlined, with lesser but more highly skilled workers needed to operate smarter machines and tools. “We are also seeing how facilities management and maintainability can be better integrated upfront at the building design stage, so we achieve a more efficient, green and sustainable city of the future,” he added. The idea is to ultimately bring all these plans together horizontally to provide all-in-one integrated services for building projects.